Fine D.M., Tobias A.H., Bonagura J.D. Cardiovascular manifestations of iatrogenic hyperthyroidism in two dogs / J Vet Cardiol. 2010 Aug;12(2):141-6. Two dogs were diagnosed with iatrogenic thyrotoxicosis (1 definitive, 1 presumptive). Both showed physical examination findings of agitation, tachypnea, and tachycardia. Sinus tachycardia with supraventricular ectopy was diagnosed in one case, and syncope and atrial flutter was present in the other. Both dogs had concurrent cardiac disease that might have contributed to the severity of their clinical signs. Excessive thyroid hormone supplementation in humans causes supraventricular arrhythmias including sinus tachycardia, supraventricular tachycardia, atrial fibrillation, and atrial flutter. Clinical signs and rhythm abnormalities resolved in both dogs with resolution of the thyrotoxicosis. A 9-year-old, 32 kg intact male golden retriever was presented to the University of Missouri, Veterinary Medical Teaching Hospital with a 10-day history of frequent episodes of laying in lateral recumbency and panting heavily. His owner reported that she could palpate a "pounding and rapid heart rate” over his precordium during these episodes, which had also occurred intermittently for the preceding 4 months. The dog was also reported to be polyphagic. He had been diagnosed with hypothyroidism an uncertain number of years prior to admission, and was receiving levothyrox- ine 0.04 mg/kg q 12 h chronically. On physical examination the dog was hyperthermic (104.2 °F, reference range 100—103 °F), very anxious, and panted continuously. On auscultation there was a 4/6 left apical and 2/6 right-sided systolic murmur. Heart rate was 130—150 bpm and predominantly regular with short paroxysms of tachycardia. Femoral arterial pulses were hyperkinetic when the rate was 130—150 bpm, but weaker in quality during the bouts of tachycardia. The precordial impulse was hyperdynamic, and mucous membranes were hyperemic. An electrocardiogram (ECG) showed a sinus tachycardia with frequent isolated supraventricular premature complexes. Although no sustained episodes of tachycardia were captured, it was presumed that the tachyarrhythmia heard on auscultation was most likely paroxysmal supraventricular tachycardia. The only other abnormality was an increase in the R-wave amplitude (3.8 mV; reference range < 3.0 mV). A serum biochemistry panel was normal. Echocardiography demonstrated moderate mitral and mild tricuspid regurgitation, due to valvular changes consistent with chronic myxomatous degeneration. On M-mode there was moderate enlargement of the left atrium ([LA] 3.8 cm, reference range 2.2—2.8) with a left atrial to aorta ratio (LA:Ao) of 1.8. The left ventricle (LV) in diastole was also increased (5.9 cm, reference range 4.3—5.1). Systolic function was hyperdynamic with a fractional shortening of 48%. Serum for total T4 concentration ([TT4]) was collected approximately 6 h after the morning levothyroxine dose was administered. Results were not available until 4 days after sampling; however, the dog was suspected of having iatrogenic hyperthyroidism based on clinical signs and a dose that was twice the high-end of the recommended range (0.02 mg/kg q 12—24 h).1 The owner was advised to discontinue levothyroxine for 48 h, and then restart at 0.02 mg/kg q 12 h. Propranolol (0.3 mg/kg q 8 h PO) was initiated for control of the tachyarrhythmias. Results of the thyroid hormone assay confirmed the diagnosis of iatrogenic hyperthyroidism; [TT4] was 11.4 mg/dl (reference range, 1.0—4.0 mg/dl).e The dog was rechecked 3 weeks later, and the owner reported that the episodes of recumbency, panting and tachycardia had resolved. The dog’s appetite and water consumption had decreased, but the owner felt the dog was mildly lethargic at home. On physical examination the patient was panting and excited. Heart rate was 120 bpm with occasional extrasystoles. There was no change in the previously noted heart murmurs. Weight had increased by 1.3 kg. An ECG showed a normal sinus rhythm (NSR) with occasional isolated monomorphic ventricular premature complexes (VPC) and rare couplets. Thoracic radiographs showed a mildly enlarged cardiac silhouette, but no evidence of heart failure. A 4 h post-pill [TT4] was 4.01 mg/dl. Propranolol was changed to atenolol 0.4 mg/kg q 12 h to permit twice daily dosing of a beta-blocker. A Holter monitor was placed 2 weeks later to evaluate the frequency and severity of the ventricular ectopy. Results showed that the predominant rhythm was NSR, with occasional isolated VPC. Most VPC occurred shortly after placing the Holter, and, therefore, were most likely catecholamine-induced. The patient was weaned off atenolol and rechecked 3 months later. At that time the dog’s lethargy had resolved, and no episodes of panting or recumbency were reported. Heart rate was 120 bpm and regular, and there was no change in the murmurs. The [TT4] was 5.43 mg/dl (reference range, 3.0—5.0 mg/dl)f 4 h post-pill. Periodic rechecks of the patient showed progression of the degenerative atrioventricular valve (AV) disease. Approximately 15 months after the initial presentation, the dog developed congestive heart failure and atrial fibrillation. A splenic mass was found during the same hospitalization, and considered most likely hemangio- sarcoma. The patient died suddenly 3 weeks later. A 6-year-old, 41.3 kg castrated male Great Pyrenees cross was presented to Washington State University, Veterinary Teaching Hospital for evaluation of collapse. The first episode had occurred 2 days prior, and the second and third episodes occurred the day of presentation. The episodes lasted approximately 30—60 s, during which time the dog lost consciousness. He returned to normal behavior within 2 min of the episode. The dog had been diagnosed as hypothyroid 1.5- years previously based on a low [TT4] (4 nmol/L; reference range, 15—50 nmol/L)g and decreased free T4 concentration ([FT4], 10pmol/L; reference range, 12—33 pmol/L). All other thyroid panel results, which included total triiodothyronine (T3), free T3, thyroxine autoantibody, T3 autoantibody, and thyroid stimulating hormone (TSH) were within reference limits. The diagnosis of hypothyroidism was made 2 weeks after the dog had completed a course of corticosteroids for a pruritic skin condition. Therapy with levothyr- oxine was initiated at 0.025 mg/kg q 12 h.
On physical examination the dog was agitated and panted continuously. On auscultation his heart rate was 250 bpm and regular, a 3/6 left apical systolic murmur was heard. Femoral pulse rate was approximately 100 bpm, hypokinetic, and irregular. All other physical examination findings were within normal limits. Thoracic radiographs demonstrated mild to moderate left atrial enlargement. There was a mild diffuse interstitial infiltrate consistent with age-related change. The pulmonary vasculature was normal. A complete blood count, serum biochemistry profile, and urinalysis was normal. An ECG revealed a sustained regular supraventricular tachycardia with a ventricular depolarization rate of 250 bpm. A precordial thump induced a transient 4:1 AV nodal block during which atrial flutter (AF) waves were seen (Fig. 1). The cycle length of the AF waves was ~ 120 ms, indicating a flutter rate of 500 cycles per minute (CPM), and providing a rhythm diagnosis of AF with 2:1 AV nodal conduction. An abbreviated echocardiogram showed decreased LV M-mode measurements in systole (2.5 cm; reference range, 3.0—4.3) and diastole (3.6 cm; reference range, 4.8—6.0 cm). These changes were ascribed to decreased filling time secondary to the tachyarrhythmia. A subsequent echocardiogram (see below) documented LA enlargement. Levothyroxine was discontinued as the initial diagnosis of hypothyroidism was not definitive, particularly with the history of corticosteroid administration prior to thyroid function testing. Corticosteroids are known to decrease serum T4 concentrations.1 Further, hyperthyroidism is a cause of AF in humans.2,3 Treatment with diltiazem (1.5 mg/kg PO q 8 h) was initiated for rate control. Twenty-four hours after presentation the AF cycle length was unchanged, but the AV nodal conduction ratio had decreased to 4:1, or occasionally 8:1. The ventricular response rate was 100—130 bpm when the dog was calm, but reverted to 250 bpm with 2:1 conduction during excitement. Digoxin (0.005 mg/kg PO q 12 h) was added for additional rate control. The dog was admitted to the intensive care unit (ICU) for observation and telemetric ECG monitoring. A syncopal episode was observed 3 days after presentation. The ECG showed AF with a ventricular response rate of 130 bpm immediately prior to the episode, followed by 8.8 s of ventricular asystole. One minute after the episode of collapse the ventricular response rate was 150 bpm (Fig. 2A—C). Atrial flutter at a rate of 500 CPM persisted throughout this episode. During the 5 days following this syncopal episode, the ventricular depolarization rate varied from 80 to 120 bpm during periods of calm, up to 240 bpm when the dog was excited. Frequent periods of ventricular asystole lasting 3—5 s were noted and it appeared that either electrical cardioversion to sinus rhythm or implantation of a pacemaker might be necessary to prevent future episodes of collapse. The dog spontaneously converted to a NSR in the ICU 8 days after presentation, and a complete echocardiogram was obtained. There was mild LA enlargement on M-mode (3.3 cm; reference range, 2.2—2.9) with a LA:Ao of 1.4. On Doppler, moderate mitral regurgitation, mild tricuspid and aortic regurgitation; moderate sub-aortic stenosis (left ventricular outflow tract velocity of 4.0 m/s; reference range, <1.85 m/s)4; and mild to moderate mitral valve stenosis, E-wave velocity 1.7 m/s (reference range, 0.5—1.0 m/s), and A- wave velocity was 1.4 m/s, (reference range, 0.1— 0.8 m/s) 5 with a reduced EF slope and prolonged E-wave deceleration time were seen. Atrial flutter waves (small arrows) are seen, providing a rhythm diagnosis of atrial flutter with varying degrees of AV nodal conduction. (Paper speed = 25 mm/s; 1cm = 1 mV). (A) Atrial flutter at a rate of 500 cycles per minute (CPM) with a ventricular depolarization rate of 130 bpm immediately prior to collapse. (B) Atrial flutter at a rate of 500 CPM with an 8.8 s period of ventricular asystole recorded during the collapse. (C) Immediately following collapse, atrial flutter rate of 500 CPM with a ventricular rate of 150 bpm. (Paper speed = 25 mm/s; 1cm = 1 mV). Measurement of [TT4] was performed 24 h after discontinuation of levothyroxine. The result was markedly elevated for the sampling interval (75 nmol/L; reference range, 15—50nmol/L for a 4—8 h post-pill sample).g The owner was questioned regarding the possibility that the dog could have received additional doses of levothyroxine. The dog had been left in the care of friends during the 3-week period preceding the first syncopal episode. It was determined that because of treatments by multiple individuals the dog had frequently received double doses. The dog was discharged on diltiazem and digoxin at the previously prescribed doses in case he reverted to AF. He returned for a recheck 6 weeks later and was reported to have been clinically normal. Physical examination and echocar- diographic findings were essentially unchanged from the previous examination. An ECG showed a sinus arrhythmia with a rate of 90—130 bpm. A thyroid hormone panel performed 6 h post-levo- thyroxine dose showed marginally low [TT4] (8 nmol/L). All other results were within reference limits. Digoxin and diltiazem therapy was discontinued at this time. Seven months later the dog was rechecked by his referring veterinarian. The dog had been clinically normal during that interval. Total and free [T3] and [T4] were within reference limits, and an ECG showed a NSR. In the 2 cases presented here the dogs were diagnosed with iatrogenic hyperthyroidism. 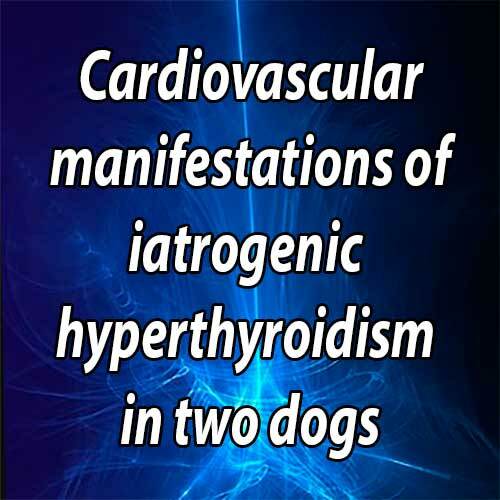 Both dogs were also affected by preexistent cardiac disease, but a compelling argument can be made that thyrotoxicosis contributed significantly to the clinical presentations. Case 1 was chronically receiving an inappropriately high dose of levo- thyroxine, while case 2 was accidentally overdosed due to miscommunication between caregivers. Case 2 was considered a presumptive case of iatrogenic hyperthyroidism since the thyroid hormone concentrations measured 24 h post-pill were only modestly elevated. However, in dogs the serum half-life of levothyroxine is 12—16 h.1 Based on the patient’s known value at 24 h, it was estimated that his [TT4] at 4—8 h would have been approximately 170—225 nmol/L.h Further, all arrhythmias and clinical signs resolved within days after thyroid hormone supplementation was discontinued. Several studies have used normal dogs as experimental models of short and long-term thyrotoxicosis. The most common finding is increased heart rate after thyrotoxicosis is induced.11,14-16 Electrocardiographic findings include sinus tachycardia, and normal R-wave amplitudes with inverted T-waves.11,14 However, arrhythmias were not reported in any of these studies. It is likely that concurrent heart disease provided the substrate necessary for development of arrhythmias in the dogs of our report. In fact, case 1 continued to have occasional VPC, and eventually developed atrial fibrillation. Presumably this was from progressive AV valve degeneration, although a contribution from previous hyperthyroid-induced myocardial disease could not be excluded. It has been reported that dogs are resistant to iatrogenic thyrotoxicosis due to their high rate of thyroid hormone metabolism, and that overt clinical signs are usually associated with doses well above the recommended therapeutic range.16,23 However, others report that some dogs are sensitive to even moderate levothyroxine over-dosage, and that clinical signs of toxicity may persist for weeks after the dose has been lowered or dis- continued.24,25 It is relatively common in the authors’ experience to measure total thyroxine concentrations above the "reference range” in dogs receiving thyroid supplementation, and this should be a consideration in any dog with a diagnosis of hypothyroidism that is undergoing cardiovascular assessment. It is important to educate veterinarians and clients that thyroid hormone supplementation is not always benign and that appropriate diagnostic studies, proper dosing, and regular post-treatment monitoring are essential to prevent adverse cardiovascular effects. Based on the 2 cases that we report here, this seems especially true for patients with preexisting cardiac disease. Scott-Moncrieff JCR. Hypothyroidism. In: Bonagura JD, Twedt DC, editors. Kirk’s current veterinary therapy XIV. St. Louis: Saunders Elsevier; 2009. p. 185-191. Deutsch PG, Kronzon I, Weiss EC. Unusually rapid atrial rate in a patient with thyrotoxicosis and atrial flutter. Chest 1975;67:350-351. Suarez WA, Van Hare GF, Wexler ID, Arnold JE. Atrial flutter: an uncommon pediatric manifestation of hyperthyroidism. Pediatrics 1997;100(2):E11. Bussadori C, Amberger C, Le Bobinnec G, Lombard CW. Guidelines for the echocardiographic studies of suspected subaortic and pulmonic stenosis. J Vet Cardiol 2000;2:15-22. Lehmkuhl LB, Ware WA, Bonagura JD. Mitral stenosis in 15 dogs. J Vet Intern Med 1994;8:2-17. Gorman RL, Chamberlain JM, Rose SR, Oderda GM. Massive levothyroxine overdose: high anxiety-low toxicity. Pediatrics 1988;82:666-669. Shammas NW, Richeson JF, Pomerantz R. Myocardial dysfunction and necrosis after ingestion of thyroid hormone. Am Heart J 1994;127:232-234. Klein I, Danzi S. The cardiovascular system in thyrotoxicosis. In: Braverman L, Utiger R, editors. Werner and Ingbar’s the thyroid: a fundamental and clinical text. 9th ed. Philadelphia: Lippincott-Raven Publishers; 2005. p. 559-568. Feldman E, Nelson R. Canine thyroid tumors and hyperthyroidism. In: Canine and feline endocrinology and reproduction. 3rd ed. St. Louis: Saunders; 2004. p. 219-249. Worth AJ, Zuber RM, Hocking M. Radioiodide (131I) therapy for the treatment of canine thyroid carcinoma. Aust Vet J 2005;83:208-214. Goel BG, Hanson CS, Han J. A-V conduction in hyper- and hypothyroid dogs. Am Heart J 1972;83:504-511. Lawrence D, Thompson J, Layton AW, Calderwood-Mays M, Ellison G, Mannella C. Hyperthyroidism associated with a thyroid adenomaina dog. J Am Vet Med Assoc 1991;199:81-83. Wysoke JM, Van Heerden J. Electrocardiographic changes associated with altered thyroid function in two dogs. J S Afr Vet Assoc 1990;61:130-132. Hoey A, Page A, Brown L, Atwell RB. Cardiac changes in experimental hyperthyroidism in dogs. Aust Vet J 1991;68: 352-355. Rutherford JD, Vatner SF, Braunwald E. Adrenergic control of myocardial contractility in conscious hyperthyroid dogs. Am J Physiol 1979;237:H590-596. Piatnek DA, Olson RE. Experimental hyperthyroidism in dogs and effect of salivariectomy. Am J Physiol 1961 ;201:723-728. Klein I, Ojamaa K. Thyroid hormone and the cardiovascular system. N Engl J Med 2001;344:501-509. Johnson PN, Freedberg AS, Marshall JM. Action of thyroid hormone on the transmembrane potentials from sinoatrial node cells and atrial muscle cells in isolated atria of rabbits. Cardiology 1973;58:273-289. Kramer MR, Shilo S, Hershko C. Atrioventricular and sinoatrial block in thyrotoxic crisis. Br Heart J 1985;54: 600-602. Talley JD, Wathen MS, Hurst JW. Hyperthyroid-induced atrial flutter-fibrillation with profound sinoatrial nodal pauses due to small doses of digoxin, verapamil, and propranolol. Clin Cardiol 1989;12:45-47. Wan SH, Lee GS, Toh CC. The sick sinus syndrome. A study of 15 cases. Br Heart J 1972;34:942-952. Nakagawa S, Higa A, Kondoh H, Koiwaya Y, Tanaka K. Cyclic sinus node dysfunction in a patient with hyperthyroidism. Arch Intern Med 1985;145:2126-2127. Refsal K, Nachreiner R. Monitoring thyroid hormone replacement therapy. In: Bonagura JD, editor. Kirk's current veterinary therapy XII. Philadelphia: W.B. Saunders Co.; 1995. p. 364-368. Belshaw B, Rijnberk A. Hypothyroidism. In: Kirk R, editor. Current veterinary therapy VII. Philadelphia: W.B. Saunders; 1980. p. 994-998. Rosychuk RA. Thyroid hormones and antithyroid drugs. Vet Clin North Am Small Anim Pract 1982;12:111-148.